Traditional nylon and polyester nets are designed to catch fish, not contain them. 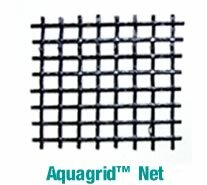 AQUAGRIDtm semi-rigid mesh is the first net created specifically for the needs of fish farming. It has the strength, low maintenance and predator protection needed to lower your cost per pound of production. AQUAGRID's stiffness makes it almost impossible for predators like seals and sea lions to grab, bite, or break through. You get a cage that keeps fish in, and other animals out. The AQUAGRIDtm net is Manufactured in USA.